Driving up Santa Fe Avenue on an unseasonable balmy Friday night, the streets teemed with people taking part in a monthly Denver tradition known as “First Friday,” as galleries stay open for the evening crowd. 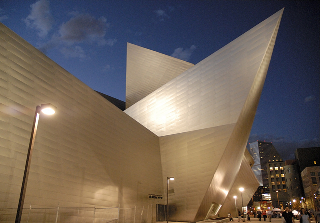 This night, with the nearby town hall bathed in pink light for a breast cancer walk, the buzz had an extra fizz: the imminent opening of the Daniel Libeskind-designed Hamilton Building of the Denver Art Museum. Three years of anticipation, and much local curiosity had reached its zenith with its grand opening weekend. The DAM was inviting the whole city to the party, over the next 35 hours. Intriguingly titled “Hot DAM: Art At All Hours,” 33,755 free tickets were distributed at timed intervals. From the new Acoma Plaza on 13th Avenue, the titanium-clad building—which Time Magazine describes as “the most captivating building to appear in the U.S. in a while”—is an explosion of massive origami shapes that jut out at all angles, the largest of which extends over 13th Avenue like the prow of a huge landlocked ship. Approaching the entrance, there is a giant whisk broom and dustpan (to attract kids and their camera-toting parents) while an equally large, whimsical spider appears to be guarding the door. 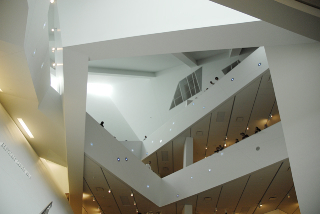 Once inside, the airy first floor belies the imposing exterior, and the myriad of exterior angles continue, in structural components, with a winding, four-story staircase affording dazzling, almost disorienting views of the space below. Concrete walls meet at odd angles, punctuated by 80 mysterious stainless-steel disks with elevator-style LED numbers that seem to blink and change at random—a mesmerizing installation called “ENGI” by Japanese artist Tatsuo Miyajima, who enlisted the aid of 80 Denver citizens to set each LED’s speed. Climbing the staircase is akin to hiking up a canyon (indeed, it has been named the “Boettcher Canyon Walk”). The second floor contains many of the most eye-catching displays, such as “RADAR: Selections from the Collection of Vicki and Kent Logan,” an eye-popping array of provocative and memorable pieces from the renowned Vail, Colorado collectors. The entrance is dominated by Michael Joo’s “Headless 2000,”an arrangement of 28 terracotta Tibetan monks, seated as if meditating, but without heads, as if they had been chopped off. Other highlights include a vivid, spellbinding trio of life-sized solid-color figures by Catherine Fritsch, representing commerce (red, suited with a cloven hoof), medicine (a white skeleton in a lab coat), and religion (a black Franciscan robed monk). A dramatic, glass-lined pedestrian walkway with views of the Rockies and the Denver skyline connects the Hamilton building to what is now known as the North Building, housing four floors of exhibits, and sample culinary art at the reinvented Palettes restaurant on the first floor. Libeskind, best known as the architect chosen to design New York’s World Trade Center Memorial, has made a dramatic statement in his acknowledgement of the progressive, pioneer spirit that Denver has always possessed. Denver’s skyline has steadily embraced a collection of distinctive buildings as its downtown continues a stunning renaissance from the doldrums of decades past. The new Hamilton Building, with its brave new way of experiencing art and space, places an emphatic exclamation point on Denver’s emergence as an international art center. Hours: 10 a.m. to 5 p.m. Tuesdays/Thursdays; 10 a.m. to 10 p.m. Wednesdays/Fridays; 9 a.m. to 5 p.m. Saturdays; noon to 5 p.m. Sundays. Closed Mondays. Prices: $10 (Colorado residents) $13 (out-of-state visitors) $8 for over-65 and students ($10 out-of-state) $3 for ages 6-18 ($5 out-of-state) and free for 6 and under. Tickets: Available at museum, by phone (866-4090-ART) or online at www.denverartmuseum.org.